Fujian (福建; Fújiàn) is a coastal province in East China. It has long been an outward-looking province, much involved in maritime trade, and is the ancestral home for many overseas Chinese, especially in Southeast Asia and the Philippines. The terrain is very hilly. There is a saying that Fujian is 80% mountain, 10% water, and 10% farmland. 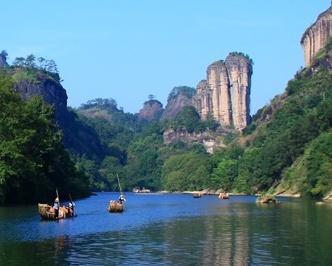 Presumably largely because of mountains and isolation, Fujian has a large number of local languages and dialects, many of which are not mutually intelligible. Population is about 37 million, which is small for a Chinese province (17th of 23) but about the same as Canada, Poland or California. The major cities are either on the coast (Xiamen and Quanzhou) or a few miles up a navigable river (Fuzhou). Although the islands of Kinmen and Matsu are officially considered to be part of Fujian province by both the PRC and ROC governments, as they are adminstered by the ROC government in Taiwan, we treat them as part of Taiwan here on Wikivoyage. These are substantial cities; none are under two million population. Fujian was an independent Minyue Kingdom, paying tribute but not part of the Chinese Empire, until 110 BC when it was conquered and the main ethnic group of the region, the Yue people, assimilated into the Han Chinese. Fujian has long been one of the more prosperous and outward-looking provinces of China, an area of traders and seafarers. In the era of tea clippers, two of China's five Treaty Ports — Xiamen and Fuzhou — were in Fujian, and Fuzhou shipped more tea than any other port. Fujian has been a large source of Chinese migrants, and many overseas Chinese in Southeast Asia, as well as the vast majority of Taiwanese trace their ancestry to Fujian. After the Second World War, times were fairly hard in Fujian; trade with traditional customers Japan and Taiwan was greatly reduced. The Chinese Civil War resulted in Fujian becoming a divided province, with most of the province being controlled by the People's Republic of China (PRC), but the offshore islands of Kinmen and Matsu being controlled by the Republic of China (ROC). In recent decades, however, Fujian has recovered; like other coastal provinces, it is now one of the more modern and prosperous areas of China. Southern Fujian has also become a popular business destination for Taiwanese businessmen due to their close cultural and linguistic ties. Light industry, especially clothing and shoes, predominates but there is some heavier industry. Agriculture is also important; in particular, Fujian produces a great deal of tea — notably some excellent Oolong teas. As a coastal province, Fujian is much involved with the sea. Fishing and fish farming are important industries and the local cuisine emphasizes seafood. Fujian has a higher proportion of Muslims than most areas of Southern China due to the history of trade via the Maritime Silk Road, and quite a few Christians since it was a focus of 19th century missionary activity. Today, all educated people in Fujian speak Mandarin. It has been the language of education throughout China since the 1950s and is now the lingua franca in Fujian as everywhere else. However, Fujian also has many local dialects. The terrain is mountainous; at one time nearly every valley had its own language. These dialects are usually described with the prefix "Min" (闽 Mǐn), where Min is another name for Fujian. These dialects are not mutually intelligible, though they do share certain common features. Generally speaking, the "Min" group of Chinese dialects is the most different from standard Mandarin of all the dialects in China. Minnan has fewer similarities with Mandarin than English has with Dutch. Among the most important is Minnan Hua (闽南话 Mǐnnán huà; Southern Min), spoken in Xiamen, Quanzhou, Zhangzhou and surrounding areas. There are slight dialectal variations of Minnan between the three cities; the Xiamen dialect is considered to be the prestige dialect. Many people in Taiwan speak the same language, though they may call it Taiwanese. In Malaysia and Singapore, the same language is called Hokkien (the Minnan word for Fujian). The Teochew dialect spoken just across the border in northern coastal Guangdong is similar to Minnan, but only partially mutually intelligible, while Hainanese is also is closely related to Minnan, but not mutually intelligible with it. The Mindong (闽东 Mǐn dōng; Eastern Min) or Fuzhou Hua (福州话 Fúzhōu huà; Fuzhou speech) dialect is spoken in Fuzhou and also has a large number of speakers in the northern coastal areas. The same language is spoken on the Matsu islands, which while closer to Fuzhou are controlled by Taiwan. In Malaysia and Singapore, it is known as Hokchiu (the Mindong word for Fuzhou). There are dialectal variations; the Mindong dialects in Fuzhou and Fu'an, which are only about 4 hours apart by car, are not mutually intelligible, though the Fuzhou dialect is considered to be the prestige dialect of Mindong. Other Min dialects include Minbei (闽北 Mǐn běi; Northern Min), Minzhong (闽中 Mǐn zhōng; Central Min) and Puxian, named for Putian city and the surrounding Xianyou county. The Hakka (客家 Kèjiā) people in the West of Fujian, and in several other areas of Southern China, came as refugees from one of Northern China's wars some centuries back. Hakka means "guest people". They have their own Hakka language (客家话; Kèjiāhuà), more closely related to Northern dialects rather than to any other Fujian language. As with the rest of China, English is not widely spoken, though airline and high-end hotel staff in the larger cities will usually have a basic grasp of English. Fujian is well connected via China's domestic airline, bus, highway and train networks. The main airports are at Xiamen and Fuzhou; both have flights many mainland cities, as well as international flights Hong Kong and other Asian cities. Xiamen is also served by long-haul flights to Amsterdam, Los Angeles, Melbourne, Seattle, Sydney and Vancouver. In addition to the aforementioned two, Quanzhou is also being connected by an increasing number of international flights to other Asian countries. The scenic Wu Yi Mountain area also has an airport with good domestic connections; often package deals are available — flights and accommodation, and perhaps a guide — for a fixed price. There are good highway connections around the province and out of it into neighboring provinces. There are regular buses from any of the main Fujian cities to any of the major cities in nearby provinces. Many of the roads are through mountainous (or at least very hilly) terrain and are feats of engineering involving a lot of bridges and tunnels. During World War II, the Japanese controlled most of Fujian but did not reach Sanming because of the mountains. Today, it is a few hours' drive on good roads from Fuzhou. There is a high-speed rail line in service which connects the main cities along the Fujian coast north to Wenzhou, Ningbo, Hangzhou and Shanghai, and south to Shantou and Shenzhen. Speeds are over 200 km/hour (125 mph) and the Fuzhou-Shanghai trip takes about six hours. Two more high-speed lines connect the province with the interior of the country: one runs from Fuzhou to Hefei (and, ultimately, Beijing); the other, from Fuzhou and Putian to Nanchang (in Jiangxi), with some trains continuing to Wuhan (in Hubei). Older rail lines which wind inland through the mountains carry passengers as well and are considerably cheaper, but much less convenient. For example, Fuzhou-Shanghai costs ¥130 instead of ¥280 (or ¥330 first class) on the fast train, but it takes 17 hours instead of 6. There are ferry boats to Taiwan-controlled islands that are located near the Fujian coast: from Mawei (a suburb of Fuzhou) to Matsu, and from Xiamen to Kinmen. From Matsu, it is possible to continue to the main island of Taiwan. There are also ferries direct from Xiamen to Taiwan, but not from Kinmen to the main island of Taiwan. There may also be a ferry to the main island of Taiwan from Pingtan. The main mode of intercity travel is traditionally by bus. The standard low-cost low-speed trains are less convenient in Fujian than elsewhere because they wind around a lot in the mountainous terrain. Flying within the province is relatively expensive. New lines for high speed trains, on a more direct route along the coast, are now in service. For anywhere they go — Zhangzhou, Xiamen, Quanzhou, Putian, Fuzhou, Ningde and off toward Zhejiang and Shanghai — they are now the most convenient way to travel. Wuyishan: Climb up this mountain and enjoy the view from the top. It is worth it! It takes about an hour to reach the top and half an hour to come down. Enjoy the scenic bamboo raft ride down the river. You get to see huge rocks of different shapes and sizes - some of which resemble people or animals. You will also get to see some "hanging coffins" - coffins, believed to be more than 2000 years old, placed inside large cracks in some of the gigantic rocks. These cracks are about 20–40 metres above the river. Nobody knows how the coffins got there. The ride takes about one-and-the-half hours. Each raft comes with two rowers and can take six passengers. Gulangyu is a smaller island next to Xiamen Island, across the 500-meter-wide Lujiang from downtown Xiamen. Gulangyu was originally named round sandbar (Yuen Chau Tsai) during the Ming Dynasty because of a grotto created by the action of the waves. Gulangyu is known as “Sea Garden” since the island climate is warm in the winter and cool in the summer, as if it experiences spring all year around. All kinds of flowers bloom, and the grass and leaves are always green. The China Danxia landscape near Taining are inscribed on the UNESCO World Heritage List. The provincial museum is in Fuzhou, in the park beside West Lake (西湖 Xīhú). Mawei (马尾 mǎwěi), just outside Fuzhou, has a museum commemorating a battle there between the Chinese navy and the French in the 1880s. Xiamen has an Overseas Chinese Museum, located downtown roughly halfway between the ferry terminal and Xiamen University (厦门大学 Xiàmén dàxué). Quanzhou, formerly one of the world's great ports (Marco Polo considered it "one of the two greatest havens in the world for commerce"), has a Maritime Museum. One could plan a tour of Fujian devoted to exploring its amazing variety of religious structures. Xiamen, Fuzhou and Quanzhou all have major Buddhist temples, and there are dozens of lesser temples in smaller cities or scattered around the countryside. The Hualin Temple (Chinese: 华林寺) in Fuzhou, founded in 964, is one of the oldest wooden structures in China. Of course there are many Taoist and Confucian temples as well. Quanzhou has Qingyuan Mountain, a major Taoist site that attracts visitors from all over China, partly because it has a famous statue of Lao Tse, the founder of Taoism. The original Shaolin Temple, one of China's greatest centers of kung fu, is in Henan, but during one of China's many wars a lot of the monks fled South and founded Southern Shaolin with one temple on Qingyuan Mountain and another in Putian. Quanzhou also has relics of several religions introduced via the Maritime Silk Road. It has one of China's oldest mosques, built in 1009, and the tombs of several Moslem saints. Across the river in Jinjiang is the world's last Manichean temple. Quanzhou and Jinjiang have relics of Nestorian Christians; the sect was based in Persia and sent missionaries east, reaching China by the 7th century AD. The first Catholic missionaries, Franciscan monks, reached China via Quanzhou in 1313. Fujian was also a major area of missionary activity in the 19th century and well into the 20th. Christian churches of various denominations abound; China's oldest Protestant church is in Xiamen. The cities all have several churches and many villages have one or two. Meizhou Island, near Putian, has the main temple of the sea Goddess Mazu; the annual festival in her honour attracts tens of thousands of worshippers from all over the Chinese diaspora, especially fishermen and sailors. Fujian has its own cuisine, largely based on seafood. Fish Balls (鱼圆 yú yuán, 鱼丸). are made of minced fish and egg white, mixed with flour. Some varieties of fish balls have pork or shrimp added. These are then cooked in boiling water. Wind duck paste. Wind duck paste, is to use sweet potato powder (sweet potato flour) and hacked to pieces of the wind duck, winter bamboo shoots and silk, the film mushrooms, meat, garlic paste mixed with boiled. Tai Chi Taro. is to cook taro nut and pressed into mud, adding sugar, eggs, water and oil. After the taro cool down, people sometimes add chopped kernels, cherry on the surface.It is one of the traditional Fujian’s desserts. Light Cake. It is made with raw material of flour, salt, sesame seeds. The shape of light cake is similar like Donuts. It doesn’t have much taste. In Fuzhou, people usually do not face sesame cake is called "light cake", with the sesame, they called "Fuqing cake. Wonton (云吞 yúntūn). is the most common snack in Fujian. The wonton skin is thin, it cooks in a short time. The boiled dumplings would be required in the process of adding cold water 2 times. After cooked, it looks half transparent. Fo Tiao Qiang (佛跳墙 fó tiào qiáng). means "Buddha jumps over the wall". It is the most famous food in Fujian. It contains dainties of more than 30 kinds: Shark's fin, sea slug, chicken breast, duck, pig's trotters, dried scallop, mushroom, abalone, pigeon egg. with other condiments. It's said that after the dish is cooked, the air is heavy with a strong fragrance. Legend has it that it smelt so good that a monk forgot his vegetarian vows and leapt over the wall to have some, giving rise to its name. Fujian is famous for tea (in the 19th century, Fuzhou was China's busiest tea port) and you can get good tea almost anywhere. In fact, the English word "tea" was derived from its Minnan name. Try the tea eggs (茶葉蛋 cháyèdàn), hard boiled eggs cooked in tea, available on streets everywhere. Like most of China, Fujian has quite a few locations for several large coffee chains, including UBC Coffee (上岛咖啡 shàngdǎo kāfēi), Ming Tien and SPR. For most Western tastes, SPR are easily the best of those, but avoid their airport locations which have astronomical pricing. There are also some good smaller chains, Blenz, Dawin and King Buck; these are usually cheaper. As anywhere in China, beer is widely available. Hui Quan is a Fujian brand, a light palatable lager. Tieguanyin Tea (铁观音 Tiěguānyīn). (Name of a Godness) This tea is grown in Songlintou and Yaoyang in the Fujian Province. It is one of the cherished teas grown in Fujian. White Tea. The white tea is grown in various regions of Fujian including the ShuiJie and Zhenghe counties. The white tea leaves have a unique shape. White tea is a little bit fermented tea with a mild flavor but leaves a sweet taste later. Like other areas on the Southern coast of China, Fujian is prone to typhoons, which occur mostly from July to September. The province is also located on several small fault lines, and so is occasionally hit by earthquakes, though these tend to be minor. Neighboring provinces along the coast are Zhejiang to the North and Guangdong to the South. Jiangxi lies inland of Fujian. There are good connections to any of these by road or rail. The Taiwanese-controlled islands of Kinmen and Matsu can be visited by regular ferry service from Xiamen to Kinmen (30 minutes or 1 hour) or from Fuzhou (Mawei) to Matsu (2 hours). There are also ferries directly to the main island from Taiwan from Xiamen and possibly Pingtan, as well as ferries continuing from the Taiwan-controlled Matsu Islands to Taiwan. There appears to be no ferry from Kinmen to Taiwan, only direct from Xiamen to Taiwan. This region travel guide to Fujian is a usable article. It gives a good overview of the region, its sights, and how to get in, as well as links to the main destinations, whose articles are similarly well developed. An adventurous person could use this article, but please feel free to improve it by editing the page.